The Borg Fan Collective has the top ten most popular Borg episodes as picked by the fans! Witness all the characters from Star Trek: The Next Generation, Enterprise and Voyager as they defend their ships, galaxies, and their own kind. For thousands of years the Borg have been spreading throughout the galaxy, conquering, assimilating and thus destroying countless civilizations. Following every encounter, the Borg catalogue each new species with a numerical designation instead of a proper name. The goal of the Borg, in most cases, is to completely assimilate each species by incorporating their knowledge and technology into the unified Borg Collective. One by one, each living being is converted into Borg Drones. In many cases, all that remains of an assimilated civilization is the memory of its unique contributions that now resides only within the accumulated knowledge of the Borg. That and the numerical species designation. Often even the name is lost, forgotten or deleted as irrelevant. Conversely, the species designations give a sense of the long and terrible history of the Borg and the thousands of species they have encountered and absorbed. Now that every single live-action episode of Star Trek available on DVD and all 10 movies are out as special editions, the folks at Paramount have to find some other way to profit from their most cherished franchise. And here it is: themed compilations! 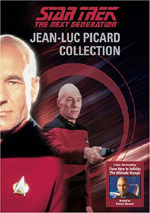 We already got one of these back in 2004 with the two-disc Jean-Luc Picard Collection, but now the packages will branch out into episodes that span multiple Trek series. In no way do I claim to know Trek continuity well, but I could have sworn that Starfleet first heard of the Borg during Next Generation’s run. However, this episode firmly establishes the species 200 years earlier, though not by name. Maybe there’s some explanation for this that I don’t know. Anyway, “Regeneration” manages to bring the Borg into the Enterprise timeline with an exciting episode. The Borg always were one of the best Trek villains, and they give the crew a run for their money. It’s interesting to see them deal with this unknown threat, especially since their primitive technology – compared to the Next Gen folks, at least – makes things more difficult for them. Q Who? (Next Generation Season Two): Despite his prior agreement to stay off the Enterprise, Q (John DeLancie) returns. Apparently the other members of the Q Continuum booted him due to his indiscretions, so he wants to join the crew of the Enterprise since they’re so much fun. Q argues they need him to help deal with the challenges ahead. When Picard states that they can do fine on their own, Q gives them a view of what will come via an early encounter with the horrific Borg. ”Q Who?” would merit historical notation since it provides the series’ first reveal of the Borg, but it stands nicely on its own. During the first season, I worried that the show would rely too heavily on Q; he only popped up twice, but those programs occurred in fairly rapid succession. Q appeared just this once in Season Two, and that allowed his arrival to become more powerful. The Best of Both Worlds, Part I (Next Generation Season Three): The Enterprise receives a distress signal from one of the Federation’s most distant colonies. When they arrive, they find nothing where a town used to be. Suspicions immediately arise that the Borg caused this disappearance. To investigate this event, Admiral Hanson (George Murdock) and Commander Shelby (Elizabeth Dennehy) come aboard the Enterprise. Shelby proves to be very ambitious, and she seeks the position it appears Riker may vacate for the captain’s chair elsewhere. This leads him to question his own decisions, as he doesn’t understand his reluctance to leave the Enterprise. When eventually the Enterprise meets up with the Borg, they provide a peculiar demand: for Picard and Picard alone to leave the ship and come to their Cube. He refuses and battle ensues. Thanks to a tactic thought up by Shelby, they manage to break free of the Borg grasp long enough to escape, where they enter a dense nebula to evade them while they regroup. Eventually the Borg break through, abduct Picard, and set a course for Earth. “Best” lived up to its title and provided one of Season Three’s strongest episodes. The Best of Both Worlds, Part II (Next Generation Season Four): A discussion of the second show’s events would necessarily include spoilers for the first one, so I’ll just refer you back to the synopsis I offered for that episode. Any additional comments could ruin the fun for folks who haven’t seen the shows, so I’ll end my synopsis there. Suffice it to say that Best II concluded the tale in a very satisfying manner. Like many Trek programs, it placed the Enterprise in an apparently unwinnable situation against an apparently unbeatable foe, and it requires their collective ingenuity and bravery to save the day. Best II packs a nice combination of cleverness and action. I, Borg (Next Generation, Season Five): The Enterprise receives a signal from a moon in an obscure star cluster. When an away team beams down to investigate, they find a crashed Borg vessel with one survivor. Dr. Crusher convinces Picard to bring it on board the ship for repairs. This starts a number of philosophical discussions, particularly when Picard wants La Forge to find a way to spread a virus through Third of Five (Jonathan Del Arco). Crusher and La Forge attempt to test and work with the Borg, who starts to develop an identity and adopts the name Hugh. The timer starts to tick when the Enterprise detects the impending arrival of a Borg scout ship, so the crew needs to figure out how to deal with this moderately humanized example of that species. It lacks the action usually found in a Borg episode, and it gets a little sappy at times, but “I, Borg” offers a fairly solid program. The development of Hugh provides an intriguing element, and the plot displays some neat twists and turns. While not one of the show’s great episodes, “I, Borg” represents a solid piece of work. Descent, Part I (Next Generation, Season Six): This brings back the Borg for the first time since Season Five’s “I, Borg”. Actually, these two programs connect in other ways, as “Descent” conjures the memories of Borg soldier Hugh. The Enterprise intercepts a distress call from a base, and when they arrive, they find the Borg attacked it. However, these Borg seem different, as they don’t care about assimilation and they display other unusual behaviors. In addition, in the midst of the away team’s defense, Data gets mad, which manifests his first documented emotion. The Enterprise goes on patrol to try to deal with the rogue Borg while Data attempts to come to terms with his burgeoning feelings. Eventually, the two streams merge, as one manipulative captured Borg feeds Data’s desire to re-experience emotions. At least over the series’ first six years, Next Generation didn’t botch Borg-related programs, and “Descent, Part I” offers yet another good one. It sets up the issues well, gives us just enough information to keep us interested, and ends with a very intriguing cliffhanger. Descent, Part II (Next Generation, Season Seven): Again, I’ll skip a synopsis for the second part since it might offer spoilers. I preferred the intrigue of “Descent, Part I” to the resolution seen here, but the episode still finishes the saga in a fairly entertaining manner. On the positive side, the show makes more balanced use of the series’ main characters than almost all other programs. Each of our significant seven get to do something reasonably active, though a few personalities dominate. Overall, however, the episode seems a little flat, and doesn’t provide a terrific payoff for the scenario. In the end, “Descent” gives us good but unexceptional Trek. Like most episodes that function as the first part of two, “Scorpion” deals mainly with exposition. It does set up an interesting concept, and it progresses in an intriguing way. I look forward to its conclusion. Although I never watched Voyager prior to the existence of the DVDs, I was always aware of the babealicious Seven of Nine, and this episode proves interesting since it introduces her to the series and explains how she ends up on the ship. It also presents some pretty solid action and intrigue, as the Borg/Voyager alliance offers nice fodder for a good story. “Scorpion” launches Season Four on a high note. For the final Voyager cliffhanger, we return to the reliable Borg well. It definitely takes an intriguing path. The bits with Seven in the Unimatrix tend toward a little too much soap opera, but the show pursues a strong course and ends in such a way to make me eager to see its conclusion. Unimatrix Zero, Part 2 (Voyager Season Seven): "The away team must infiltrate the Borg Collective and execute their plan to undermine them, even though it may destroy Unimatrix Zero forever." Endgame (Voyager Season Seven): "After a decades-long journey to reach the Alpha Quadrant, Admiral Kathryn Janeway makes a bold decision to change the past in an attempt to undo the toll taken on the crew during their arduous journey home." However, it doesn’t wrap up the various characters in a strong manner. Perhaps that makes it more realistic, but I’d have liked a more conclusive resolution. This one feels a bit nebulous and tentative. It’s a good episode and one of its season’s best, but just not as memorable as I might prefer. Star Trek: Borg Fan Collective mostly appears in an aspect ratio of 1.33:1 on these single-sided, double-layered DVDs; due to those dimensions, the image has not been enhanced for 16X9 televisions. The sole exception comes from DVD One’s “Regeneration”, which uses an anamorphically-enhanced 1.78:1 ratio. Since these episodes spanned three series, they offered distinctly varying visuals. I’ll look at each one of those separately. Without question, Enterprise’s “Regeneration” was the most attractive. Sharpness consistently came across well. Virtually no instances of softness appeared throughout the series. Instead, the shows were distinctive and tight. Jagged edges and shimmering created no concerns, and I also noticed no problems with edge enhancement. Source flaws appeared absent, as I didn’t discern specks, marks or other issues. Some light grain was there at times, and that was about it. The palette varied depending on the context of the episode. Much of the time the colors were a bit restrained, but sometimes they took on more dynamic tones. Overall, though, they were consistently strong. I thought the hues remained accurate and full within their design. Blacks seemed firm and deep, while low-light images gave us good definition and visibility. “Regeneration” offered “A-“ visuals. Without question, the Next Generation episodes were the least attractive. Sharpness came across as somewhat erratic. Most of the time, the picture looked fairly distinct and detailed, but that varied during many occasions. Not surprisingly, wide shots seemed the most problematic, but even close-ups remained inconsistent and could appear moderately soft. Shimmering and jagged edges showed up periodically. Edge enhancement created some minor concerns. As for source flaws, I noticed a few speckles and marks, and the shows could be a bit grainy. Colors appeared somewhat erratic as well. At times, the colors looked nicely rich and distinct, but they also came across as dull and murky for parts of the shows, and some red light was somewhat runny. In general, the hues were acceptable but unspectacular. Similar elements marked the black levels, which seemed reasonably deep much of the time, but they also could be a bit muddy on occasion. Shadow detail tended to be somewhat murky. Shots could come across as heavy and flat at times, though the images stayed fairly solid. Overall, the Next Generation episodes deserved a “C+” for their visuals. 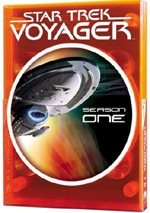 The Voyager episodes fell between the two other series. Sharpness usually appeared nicely developed. At times I thought matters became a little soft, but not frequently. Usually the shows were well developed and concise. Some minor instances of jagged edges and shimmering popped up, but I didn’t discern any edge enhancement. Source defects also remained absent. Not a show with a broad palette, Voyager did offer pretty natural tones. As with the prior volumes, the colors tended to appear reasonably dynamic and vivid. Colored lighting succeeded as well, for those shots came across as clean and concise. As with most Trek shows, blacks were a little muddy but not badly so, and shadows appeared slightly dense at times. I felt those concerns stayed modest, and the programs looked more than good enough to merit a “B+”. All things considered, I combined these grades to give the whole package a “B”. Although the various series’ visuals could differ considerably, they all maintained fairly similar audio. Actually, Next Generation was a little more active than the others, but not to a radical degree. All of the episodes offered Dolby Digital 5.1 soundtracks. The soundfields of the various shows seemed pretty engaging. The forward spectrum dominated, and it offered fine stereo imaging for the music as well as a strong sense of atmosphere. The front speakers provided a clear and vivid environment, and various elements like ships and phaser fire panned cleanly across the channels. Planet environments often came across nicely, as they offered lively and engaging audio. For the most part, the surrounds offered general support of the front speakers. The back channels mostly gave us a good sense of environment, and they also added musical support. When compared to many of the earlier years, I noticed slightly increased usage of the surrounds, and some split surround material became more apparent. In any case, the 5.1 mixes didn't reinvent the wheel, but they opened up the tracks nicely. < Audio quality seemed quite good. Throughout the shows, the lines remained distinct and natural, and I heard no significant problems related to edginess or intelligibility. Music was nicely vivid and bright, as the quality of the music remained consistently clear and bold. Effects showed good clarity and accuracy, and they displayed very few signs of distortion. All elements provided fairly solid nice bass response, as low-end seemed deep and rich throughout the shows. All in all, I was very pleased with the Dolby Digital 5.1 of these programs. When we look at supplements, we get one retread from earlier packages and a few new components. The duplicated piece comes from an audio commentary for DVD One’s “Regeneration”. We find notes from writers Michael Sussman and Phyllis Strong. The pair sit together for their running, screen-specific discussion. They go over the genesis of the stories, their themes and connections to other Trek, and some specifics about their elements. They also discuss reactions to the shows and some positives and negatives they perceive. “Regeneration” gets most interesting when they talk about the passionate criticisms they got from fans, and they attempt to defend themselves against these. Expect a lot of tap-dancing as they try to justify putting the Borg in this series. The track doesn’t shine, but it offers more than enough good information to deserve your attention. Three shows boast brand-new text commentaries. These come for DVD One’s “Best of Both Worlds, Parts 1 and 2” and “Unimatrix Zero, Part 2”. As always, Michael and Denise Okuda write these. As always, they cover the usual array of topics. The Okudas talk about set design, guest cast, visual effects and stunts, connections to other Trek series and episodes, props, and factual details. As always, these give us good background and notes as they help tie in the episodes and the series to the bigger world of Trek. They’re consistently satisfying. Some folks dislike these themed compilations, but I think they’re fine for what they are. Since Paramount has already released all of these episodes as part of their original series sets, it causes no harm to put them out in different packages. Star Trek: Borg Fan Collective gathers a slew of Borg shows in one place, and that offers a fun way to check out the evolution of their depiction across three series. Moderate variations occur in picture quality, but the shows always look fine, and they occasionally present pretty terrific visuals. Audio consistently seemed very good, and we get a few nice extras. This set probably won’t prove useful for fans who already own the various season packages, but if you want a good taster of Trek Borg episodes, this is a fine release.